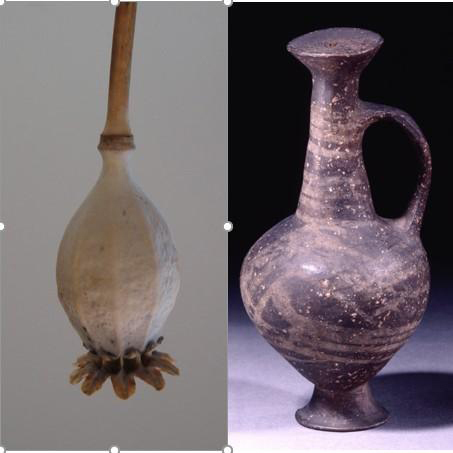 Vessels of this type, known as ‘base-ring juglets’, have long been thought to have links with opium use because when inverted they resemble the seed head of the opium poppy; they are known to have been widely traded in the eastern Mediterranean ca. 1650 – 1350BC. Using instruments in the Centre of Excellence in Mass Spectrometry at the University of York, Dr Rachel Smith developed the new analytical method as part of her PhD at the University’s Department of Chemistry. Dr Smith said: “The particular opiate alkaloids we detected are ones we have shown to be the most resistant to degradation, which makes them better targets in ancient residues than more well-known opiates such as morphine. Professor Jane Thomas-Oates, Chair of Analytical Science in the Department of Chemistry, and supervisor of the study at the University of York, said: “The juglet is significant in revealing important details about trade and the culture of the period, so it was important to us to try and progress the debate about what it might have been used for.